Joseph Henry (1797–1878) was born near Albany, New York. While largely self-educated, he attended the Albany Academy and later taught there, as well as at the College of New Jersey (now Princeton University). A physicist and natural philosopher, Henry was noted for his research into electromagnetism and pioneering work in data collection and analysis. In 1846, he was appointed the first Secretary of the Smithsonian Institution and served until his death. Joseph Henry as a young man. From miniature, c. 1829, attributed to Julius Rubens Ames. 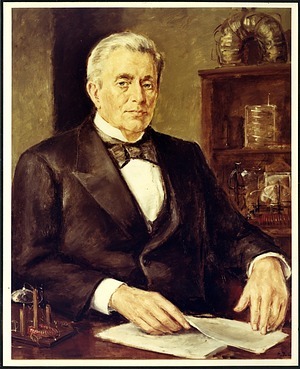 Joseph Henry as the first Secretary of the Smithsonian Institution from 1846 to 1878, c. 1829, by Unknown, painting, courtesy of Smithsonian Institution Archives, Accession 11-006, MAH-69029. Joseph Henry and Dr. Nathan William Cole, 1843, by Auguste Edouart, silhouette, courtesy of National Portrait Gallery, NPG.91.126.43.B. 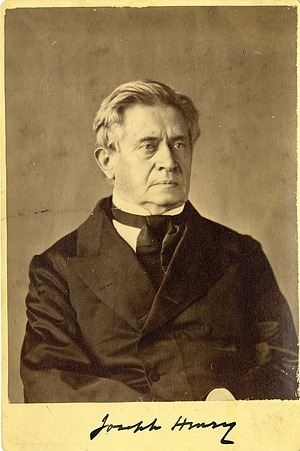 Photograph of a painting of Joseph Henry (1797-1878), physicist and first Smithsonian Secretary (1846-1878), c. 1860, by Unknown, photographic print, courtesy of Smithsonian Institution Archives, Record Unit 95, Box 11, Folder: 17, 82-3172. 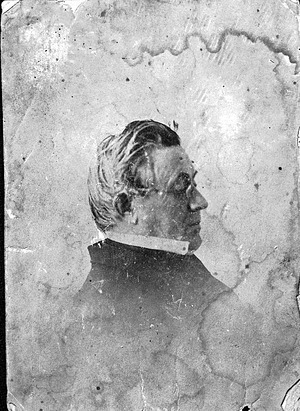 Card photograph portrait of Joseph Henry (1797-1878), physicist and first Smithsonian Secretary (1846-1878), who is seated, facing right, and wearing glasses in this portrait, 1862, by Titian Ramsay Peale, carte de visite, courtesy of Smithsonian Institution Archives, Record Unit 95, Box 27-B, 10603 and MAH-10603. Men of Progress, 1862, by Christian Schussele, oil on canvas, courtesy of the National Portrait Gallery, NPG.65.60. Joseph Henry is standing to the left of the pole. Joseph Henry, c. 1862-1865, by Mathew Brady Studio, photograph, courtesy of National Portrait Gallery, NPG.77.177. Joseph Henry, c. 1860, by Mathew Brady Studio, photograph, courtesy of National Portrait Gallery, NPG.81.M116.D1. 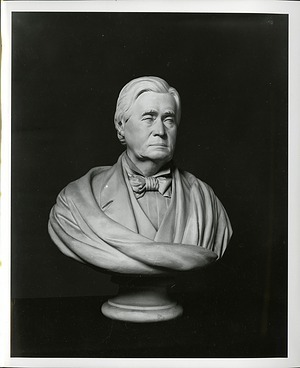 This bust of first Smithsonian Secretary Joseph Henry was sculpted by Clark Mills. The original bust is in the collections of the Smithsonian American Art Museum, c. 1870s, by unknown, photographic print, courtesy of Smithsonian Institution Archives, Record Unit 95, Box 11, Folder: 27, SIA2012-3558 or SA-10 or 24759. Joseph Henry (1797-1878), physicist and first Secretary of the Smithsonian Institution from 1846 to 1878, seated in a chair, 1870s, by Unknown, photographic print, courtesy of Smithsonian Institution Archives, Record Unit 95, Box 11, Folder: 9-C, 781 and MAH-781. Joseph Henry (1797-1878), physicist and first Secretary of the Smithsonian Institution (1846-1878), is seated, looking to his left, April 1873 by Thomas Smillie, carte de visite, courtesy of the Smithsonian Institution Archives, Record Unit 95, Box 27B, Folder: Joseph Henry #11775, SIA2009-1254. 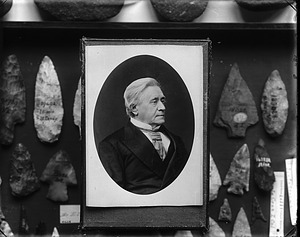 Portrait of Joseph Henry (1797-1878), physicist and first Secretary of the Smithsonian Institution (1846-1878), 1874, by T. W. Smillie, photographic print, courtesy of Smithsonian Institution Archives, Record Unit 95, Box 11, Folder: 6, MAH 42836 and MAH42836. 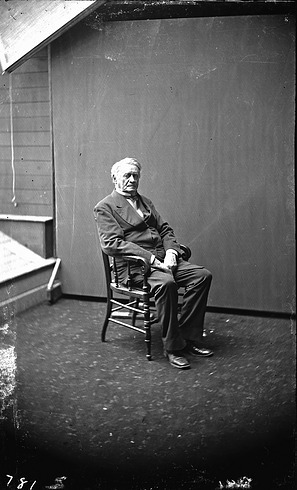 Portrait of Joseph Henry (1797-1878), physicist and first Smithsonian Secretary (1846-1878), sits in a chair with his arms crossed, c. 1875, by Mathew Brady's Studio, photographic print, courtesy of Smithsonian Institution Archives, Record Unit 95, Box 11, Folder 9C and Box 27B, SIA2012-7654 or SIA2012-2690 or 44307 or MAH 44307. Portrait of Joseph Henry (1797-1878), physicist and first Secretary of the Smithsonian Institution (1846-1878), taken on December 1, 1875. This print contains the portrait of Henry (sized 4.25 w x 6.25h) resting on top of a glass case containing a variety of arrowheads, 1875, by Fassett, photographic print, courtesy of Smithsonian Institution Archives, Record Unit 95, Box 11, Folder: 7, 10668 and MAH-10668. Joseph Henry seated at a desk, 1875, by Henry Ulke, oil on canvas, courtesy of National Portrait Gallery, NPG.79.24. Joseph Henry, 1877, by Thomas Le Clear, oil on canvas, courtesy of National Portrait Gallery, NPG.64.10. 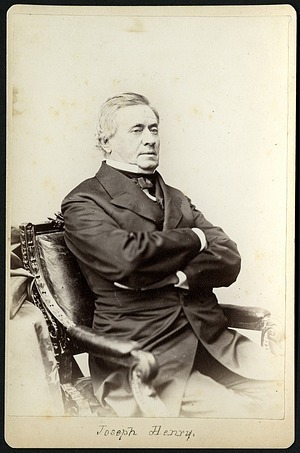 Joseph Henry, (1797-1878), physicist and first Secretary of the Smithsonian Institution (1846-1878), is standing with his left hand on a table to his left and a chair is to his right, c. 1860, by Brady & Company, carte de visite, courtesy of Smithsonian Institution Archives, Record Unit 95, Box 27B, Folder: Joseph Henry #76-5847, SIA2009-1253. 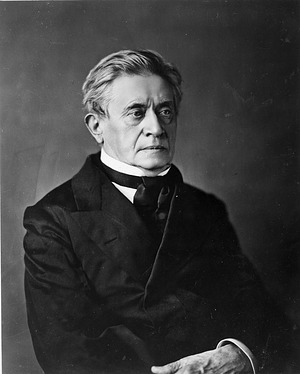 Photograph of a portrait of Joseph Henry (1797-1878), physicist and first Secretary of the Smithsonian Institution (1846-1878). Portrait painter Henry Ulke first painted Henry in 1875, for display at the Philadelphia Centennial in 1876. That portrait was transferred to the Smithsonian in 1917, and hung for many years in the Secretary's Parlor in the Smithsonian Institution Building or "Castle." This is an 1879 version by Ulke derived from the original 1875 portrait. Joseph Henry Medal created to honor Joseph Henry, first Secretary of the Smithsonian from 1846 to 1878. The likeness of Henry is probably based on the bust of Henry by sculptor Clark Mills. The medal was molded in 1879, by William Barber, born in London, England, in 1807, and died in Philadelphia, Pennsylvania, in 1879, and Charles Barber, born in London, England, in 1840 and died in Philadelphia, Pennsylvania, in 1917. The medal is gold-plated bronze, 2 1/2 x 2 1/2 x 1/8 in. (6.3 x 6.3 x 0.4 cm). An example is located in the Smithsonian American Art Museum, 1879, by unknown, photographic print, courtesy of Smithsonian Institution Archives, Record Unit 95, Box 11, Folder: 34, SIA2012-2866 or SA-11 or 10704. Joseph Henry, first Smithsonian Secretary, 1885, by Henry Ulke, oil on canvas, courtesy of National Portrait Gallery, NPG.85.49. 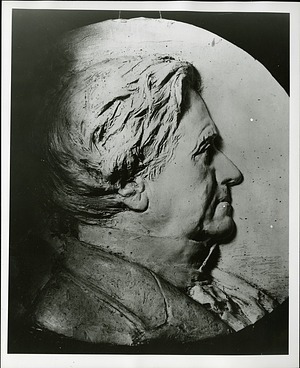 Portrait statue sculpted by John Flanagan of Joseph Henry, scientist, made for the Louisiana Purchase Exposition, St. Louis, 1904, by De Witt Ward, photographic print, courtesy of Smithsonian American Art Museum, S0000817. Here a young Henry is holding one of his inventions. This image is of a painting titled, "Professor Henry Posts Daily Weather Map in Smithsonian Institution Building, 1858." 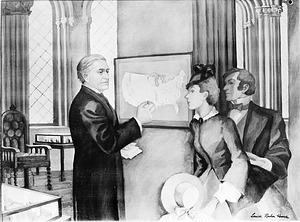 Joseph Henry, the first Smithsonian Secretary, is depicted showing visitors the weather map displayed in the Smithsonian Institution Building and updated every day. This painting was one of nine by different artists commissioned by the Smithsonian to illustrate events in Smithsonian history for the Smithsonian exhibit at the 1933 Chicago Century of Progress Exposition, 1933, by Louise Rochon Hoover, photographic print, courtesy of Smithsonian Institution Archives, Record Unit 7005, Box 186, Folder: 4 and Record Unit 95, Box 11, Folder: 12, 84-2074 or 31052-E, 94-12563. 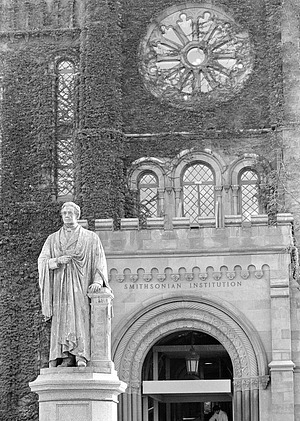 The statue of Joseph Henry, first Secretary of the Smithsonian (1846-1878) faces the National Mall in front of the Smithsonian Institution Building, or the "Castle." The statue originally faced the west wing of the Castle. However, in 1965 Secretary S. Dillon Ripley had it turned to face the Mall. The Castle is covered with ivy and "Smithsonian Institution" is enscribed above the Carriage Porch, 1979, by Pierce A. Bounds, photographic print, courtesy of Smithsonian Institution Archives, Record Unit 371, Box 4, Folder: February 1984, 79-13842-19 and SIA79-13842-19. 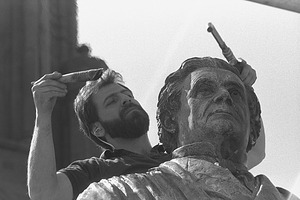 Former Hirshhorn Museum and Sculpture Garden conservator Steve Tatti works on the conservation of the Joseph Henry statue located in front of the Smithsonian Institution Building, April 12, 1984. 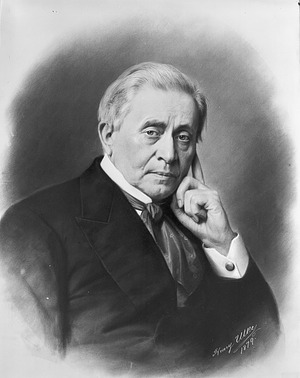 Joseph Henry was the first Secretary of the Smithsonian Institution (1846-1878), 1984, by Richard K. Hofmeister, photographic print, courtesy of Smithsonian Institution Archives, Record Unit 371, Box 4, Folder: June 1984, 84-3928-16 and SIA84-3928-16.